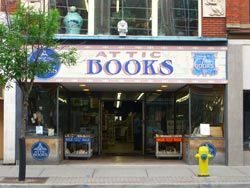 Attic Books is one of the premier retail locations for antiquarian and collectable books in Canada. We recently celebrated our thirtieth year in business. Please browse our select online stock on a wide range of subjects in books and paper collectables for the reader, scholar and the seasoned collector. Or come visit us in London, Ontario to enjoy the relaxed atmosphere of our three floor bookstore, enhanced by original tin ceilings, hardwood maple floors, and the arts & crafts fa�ade of our century building.